As I talked about earlier in the week I have been making an effort to eat everything out of my fridge and cupboard. I really want to reduce the amount of garbage and food waste that my family accumulates. We have never been really bad, I have always cooked from scratch and I even grind my own meat, but we still had some habits that could be better. One of them was my bad habit of buying vegetables and then forgetting to use them. I know that you are probably wondering how I can forgot a vegetable that I bought, but they go into the vegetable drawer in the fridge and it sometimes takes them weeks to make another appearance. Since fresh vegetables are expensive and they are only good for you if you actually eat them I have been cutting down both the number of things that I buy at the grocery store and using every last thing that I purchase. So far it has worked well. Today I made quinoa oatmeal cookies since my cupboards are packed with oatmeal and quinoa that I bought last month for a recipe. The cookies were delicious and a great way to use items that I already own. So today I decided to make dinner with the last of the veggies I had before going grocery shopping tomorrow. 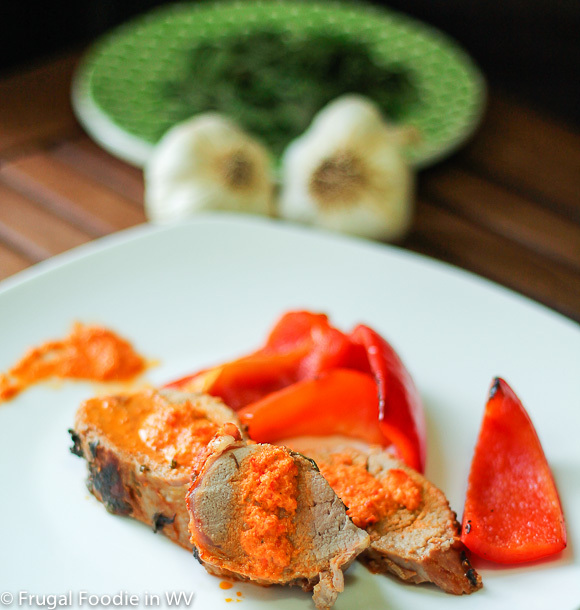 I tried a new recipe for Roasted Pork Tenderloin with Red Pepper Pesto from the January 2013 issue of Better Homes and Gardens magazine. This recipe has 7 ingredients. It takes 35 minutes of total time and makes 4 servings. I had no problems finding any of the ingredients and made no ingredient substitutions. Instead of snipping my oregano I loosely chopped it since I was making it for my two boys. Make sure to rub in the spices and oregano. The more the mixture is rubbed in the better the flavor of the tenderloin will be. I pulled out my pork at exactly 25 minutes. I normally pull out my pork at 145 degrees and let it rest to reach 150. The worst thing you can do with pork is overcook it, it becomes tough and not nearly as delicious. The recipe photo in the magazine shows the pesto on the side. I chose to serve my pesto as a sauce over the tenderloin. I thought this would lend better to the flavor and add extra tenderness to the pork. I followed the remainder of the recipe as written. The red pepper pesto was the star of this dish. Make sure to add adequate salt, it will need it and I added an extra clove of garlic for flavor. I preferred the pesto as a sauce rather than on the side. Additionally, I think it could be even better with roasted pine nuts on top. The pork was very tender and the roasted peppers made a nice side to the dish. Best of all it only takes slightly over a half an hour start to finish, so great for a week night meal. Red pepper pesto sounds fantastic. I'm the only one in the house that likes peppers, though, so all the deliciousness of this one would go to waste on my family. I'm lucky that my two boys both love red peppers, probably more than I do :) The red pepper pesto was yummy! I love pesto, but I have never tried red pepper pesto. What a delightful recipe. Thanks for the tip on cooking the pork too. I have overcooked in the past and I get so ticked off at myself. :) Have a great weekend! I love pesto too, it is great on pasta, meat or veggie. Pork is definitely a picky meat, a little bit over done and it turns tough :) Have a great weekend also! This looks amazing! Can't wait to try the red pepper pesto! What a great idea! Thanks :) The pesto really is yummy, we love sweet peppers in my house, especially my two boys.